Transcorp Removals & Storage is proud to offer one of the industry’s leading services in backloading, with Brisbane to Perth moves having benefited from our dependable interstate removals for years. If you’re planning on moving from Brisbane to Perth in the near future, we’d love to make you our next happy customer. If you don’t have enough goods to fill a truck on your own, then backloading is the smart choice. Because the available space for a backload is typically determined at the last minute, customers requiring backloading interstate removalists from Brisbane to Perth need to be somewhat flexible with their moving dates. At Transcorp, the lower cost of this service in no way reflects a lower level in care for your belongings. We use a precise inventory system to avoid mix-ups and ensure the timely delivery of goods for all interstate removals. For more information on our services in backloading (Brisbane to Perth), please don’t hesitate to contact us. 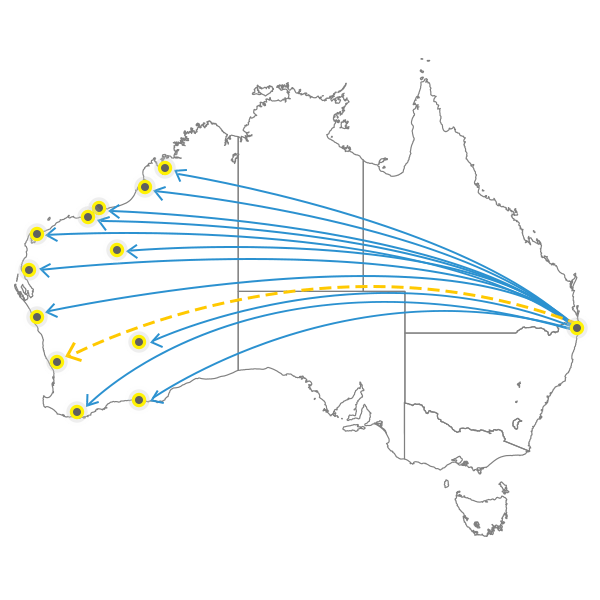 Backloading: Brisbane to Perth (WA) – How Long Does It Take? Please advise us if you require storage. Our removalists also cover all other areas in between the locations noted above. Contact us for more information. Transit Times are based on consolidation of loads (Backloading) to destinations mentioned above, and due to the volume of removals performed we may have availability to deliver quicker than noted. If requested, and if you are time critical, an exclusive vehicle or removal container can be requested to minimise transit time for your interstate move. A local removal truck (or shuttle van) may be used for areas with difficult access. Please notify your sales consultant.